The magnitude 5.3 earthquake that rattled Southern California on Thursday was the strongest in the region in several years. Southern California was rattled Thursday by a magnitude 5.3 earthquake that struck near the Channel Islands. The quake did cause some minor landslides and earth movement on Santa Cruz Island, which was close to the epicenter, and rattled the nerves of a bald eagle whose livestreamed reaction to the temblor went viral. The L.A. area feels an earthquake of this magnitude on average about once a year, Vidale said. There is a 1-in-20 chance that Thursday's quake will lead to a larger one in the next few weeks, he said. But, more than likely, smaller aftershocks that may not even be felt will follow, he said. The quake was too small and too far away from the coast to trigger any tsunami concerns. "It would never make a wave that you could see," Vidale said. But it was large enough to activate the state's developing earthquake early-warning system. Vidale said he and colleagues at USC heard beeping 10 to 15 seconds before the quake's shaking reached their campus. "We all felt it pretty well. It was small and distinct," he said. "We heard the warning go off and then we heard the shaking." The early-warning system is under development by the USGS and is available only to a limited array of testers, but it is expected that more people will be eligible to test the system later this year. For example, it would take more than a minute for a magnitude 7.8 earthquake that starts at the Salton Sea and travels up the state's longest fault, the San Andreas, to shake Los Angeles, 150 miles away. An early-warning system would give L.A. residents crucial seconds, and perhaps even more than a minute, to prepare. The temblor was located near the East Santa Cruz Basin fault zone, said Caltech seismologist Egill Hauksson, and seismologist Lucy Jones said on Twitter that the fault system "moves Southern California around a bend of the San Andreas fault." 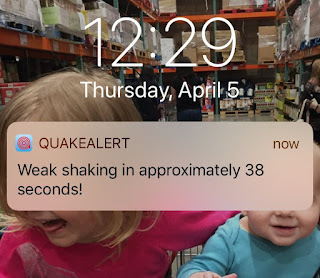 "Earthquakes happen out there now and again. There's a major offshore fault system," Hauksson said. When asked why some people felt the earthquake but others nearby didn't, Hauksson said where a person is matters a lot. "People in high rises probably felt it pretty well," he said. People on softer soils might also feel stronger shaking. Among those creatures startled by the quake were the feathered inhabitants of a bald eagle's nest high above Santa Cruz Island. A National Park Service live web camera trained on the nest shows a parent eagle and three chicks as their tree begins shaking. The parent flies off as the chicks look around bewildered. The parent eagle returns moments later, after the shaking. The last quake to be felt this widely in the L.A. area was a magnitude 4.4 in Encino in 2014. That quake also shook a wide area and was the largest in the Los Angeles area in four years. It was noted by seismologists as the strongest to hit directly under the Santa Monica Mountains in 80 years. 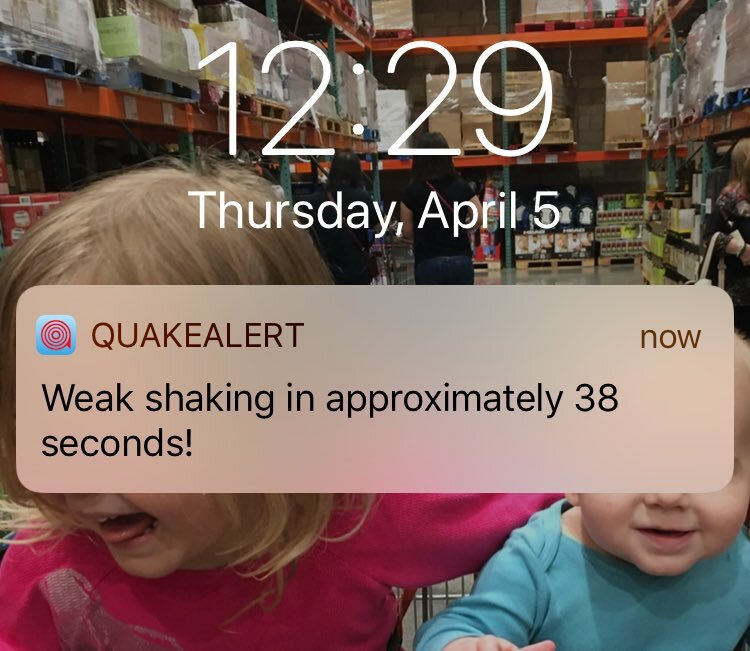 The last time an earthquake produced more energy than Thursday's temblor was in 2012, when a magnitude 5.4 earthquake struck the border town of Brawley in Imperial County. Local officials reported 20 mobile homes shifted from their foundations and cosmetic damage to downtown buildings. The epicenter of Thursday's quake was south of the Channel Islands. A magnitude 4.8 quake in the same area rattled the region in 2013, but that epicenter was much closer to the coast, three miles away from Isla Vista, and produced moderate shaking, enough to knock down a few photo frames. A park service spokeswoman told KEYT that Thursday's quake sent some bricks toppling off a chimney from a historic ranch property built in the 1860s on one of the islands. The Santa Barbara area is home to a number of earthquake faults, the largest of which is the Santa Ynez fault, which is 80 miles long and runs just north of the city. That fault is believed to be capable of triggering an earthquake as powerful as magnitude 7.5. The great Santa Barbara quake of 1925, recorded at a magnitude 6.8, destroyed much of the city's downtown on State Street, damaged rail lines, caused extensive landslides and was felt as far away as Orange County. It killed 13 people. Since the Easter Sunday earthquake of 2010 that hit along the California-Mexico border, there have been 14 earthquakes of magnitude 5 or greater in Southern California. Hauksson estimated that perhaps about half of them were felt in Los Angeles. Seismologist Lucy Jones said she received a complaint Thursday about her calling earthquake activity like this normal. Some people on Twitter asked her what the larger meaning was behind the earthquake. But there isn't any larger meaning nor a clue of when the next big earthquake will come or where it will hit, she said. Earthquake activity in the Channel Islands shouldn't be all that surprising. After all, earthquakes created the Channel Islands. In fact, mountains throughout California are generally creations of earthquakes, Jones said. 0 Response to "Largest earthquake in several years shakes Southern California, causing landslides on Santa Cruz Island"